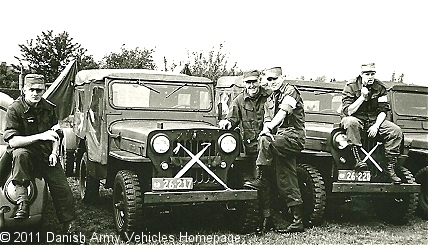 Danish Army Specific: Part of the batch bought 1952 - 1955 as supplement to the jeeps delivered under the MDAP, and to replace scrapped vehicles. Historical: The Universal Jeep CJ-3B was introduced as a 1953 model by Willys-Overland. A limitation of the wartime jeeps, and the post-war civilian models CJ-2A and CJ-3A, was the limited horsepower of the 4-cylinder L-head "Go-Devil" engine. The new F-head "Hurricane" engine, which Willys began putting in its larger vehicles in 1949, had its intake valves in the head rather than the engine block, allowing them to be larger. The vehicle had flat front fenders, but a higher-profile hood to accommodate the F-head engine. It offered higher horsepower and torque than the CJ-3A. The CJ-3B was introduced as a transitional model between the flat-fender CJ-3A, and the forthcoming CJ-5, the civilian version of the M38A1. Close to 196.000 units produced between 1953 and 1964. Length: 3.30 m (128 inches). Width: 1.52 m (60 inches). Engine: 4-cylinder (Willys F-head), 2.200 cm3 (134 cubic inches) displacement, liquid cooled. Horsepower: 75 at 4.000 rpm. Transmission: 3-speed, type Warner T-90C. Transfer case: 2-speed, type Spicer Model 18. Range: 450 km (281 miles). Additional: The electrical system was changed to 12 volt in early 1957, but 6 volt was optional until 1960.